These cats have tested positive for FIV. This means that they are more susceptible to colds and other conditions but can still live a long, healthy life. Many people adopt only FIV+ cats to give them a nice home. 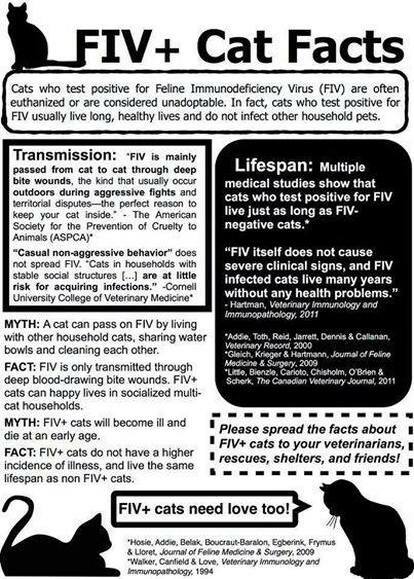 What science is finding is that FIV+ cats can live in harmony with non FIV+ cats as long as the relationship is non combative. I.e. the cats get along nicely. These cats are part of our Take A Chance On Me Program. This means the cat will go to the right home for FREE. Maybe that's your home? We have no FIV+ cats at the moment.